Our nation is in the midst of a recession that will likely prove to be the most severe since the Great Depression. In times of recession, state budgets are caught in a vise of shrinking revenue and growing need for safety net services. As the market drops and capital gains profits vanish, capital gains taxes decline. As workers lose their jobs the income taxes they pay decline. And as income from investments and labor decline, people purchase fewer goods and sales tax receipts fall. On the spending side, when people lose their jobs in a recession they rely on government to preserve access to basic needs such as health care for their families – and in the most dire cases shelter when their families are at risk of becoming homeless. There are also more long-standing causes of our state's fiscal problems. While the short-term causes of our state budget gap are largely issues outside of the control of state policy makers, the long-term causes are the direct results of policy choices. To make sense of changes in spending and tax revenues, the first question that has to be answered is: "compared to what"? To see how spending changes relate to the state's fiscal stability, we need to compare state spending growth to economic growth. If state spending grows faster than the overall economy, then budget deficits will emerge unless the state consistently raises taxes and takes a larger share of the income earned in the state to pay for the services provided through government.3 If state spending grows at the same rate as the overall economy, then the state will not experience an eroding fiscal condition, so long as tax revenue remains stable as a share of the economy. Between FY 1998 and FY 2008 net state spending grew at a modest rate, but did not keep pace with economic growth in the state. During this same period, an even slower rate of revenue growth set the stage for many of the budget problems faced today. How has state spending changed over the past 10 years? In FY 1998, net state spending4 was approximately 6.9 percent of our total economy, as shown in Figure 1 and Table 1. Had spending as a share of the economy increased between 1998 and 2008 that would explain why the state went from surpluses to deficits over that period. But that didn't happen. 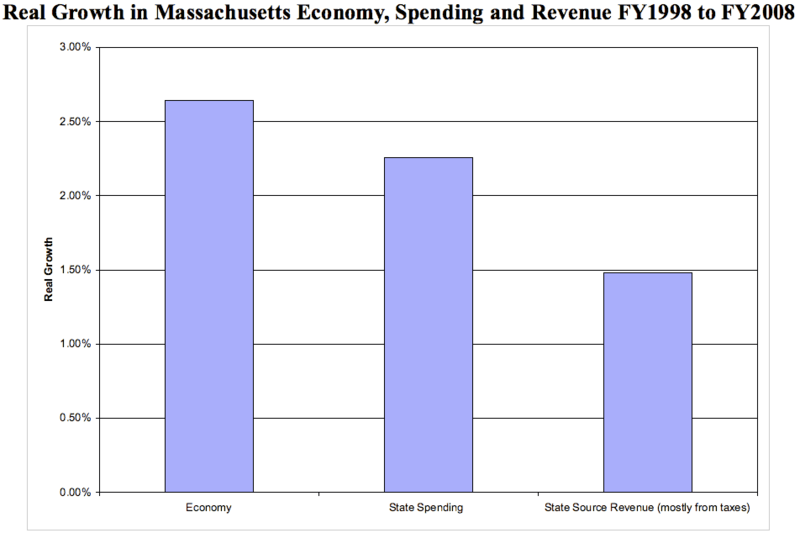 By FY 2008 net state spending had declined to 6.63 percent of our state economy (as shown in Figure 1 and Table 1). 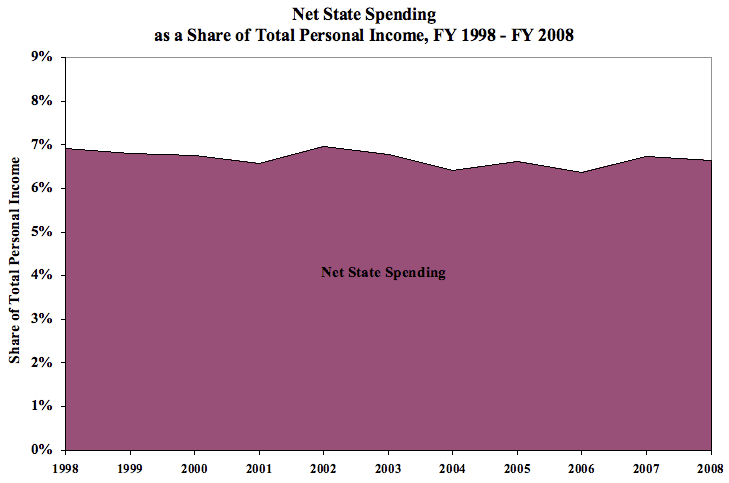 In FY 2008 the state was spending less as a share of the economy than it was in the late 1990s. If spending had grown with the economy over that period, FY 2008 net state spending would have exceeded its actual amount by more than $1.07 billion. The trends varied in different areas of government and in different parts of that decade, with an increase during the 2002 recession when incomes declined as the need for services increased, but the overall trend was down. How has state revenue changed over the past 10 years? State revenue is made up of several sources: taxes, fees, and other sources, such as the state lottery and the payments the state receives from tobacco companies as a result of litigation in the 1990s. 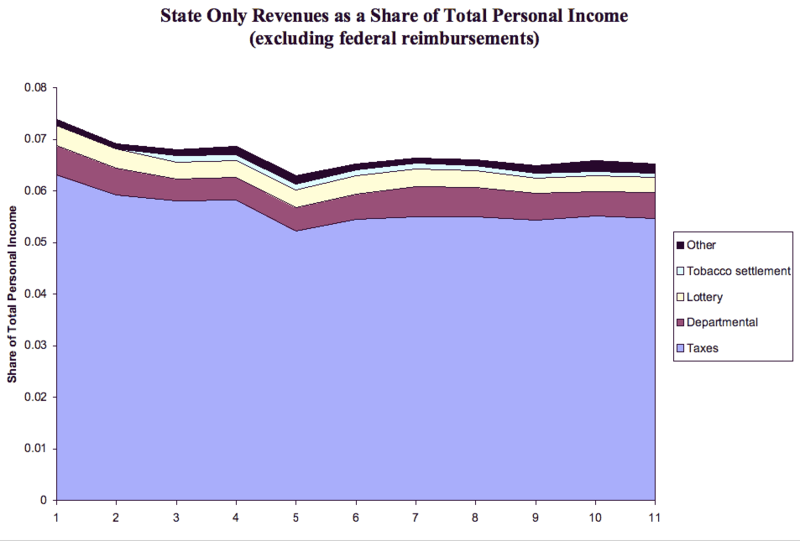 While there were declines in several of these sources, the largest declines were in state taxes, as shown in Figure 2. Between 1998 and 2008 the state cut the income tax substantially. The rate on earned income was reduced from 5.95 percent to 5.3 percent. The tax rate on dividend income was reduced by more than 50 percent, from 12 percent to 5.3 percent. Finally, the personal exemption – the amount everyone is allowed to deduct from their income before paying taxes was increased from $2,200 per person to $4,400 per person, giving each taxpayer a cut of $117. Altogether these tax cuts cost the state $2.5 billion a year. As discussed in Section 2, there were other tax policy decisions during this time that mitigated the decline in income tax revenues somewhat. Sales taxes declined steadily as a share of the economy. The decline in sales taxes was not due to specific tax policy changes, but rather to changes in the economy that undermined the ability of our tax system to collect sales taxes. These changes included the increased use of the Internet to purchase goods and the relative decline in spending on goods relative to services. Because of these trends, sales tax collections in FY 2008 were down over $1 billion dollars from their FY 1998 level. A more in depth discussion of revenue trends in Massachusetts can be found in Section 2 of this brief. How do Economic Growth, Spending and Revenue Compare? As Figure 3 shows, between FY 1998 and FY2008 our economy grew at a rate of 2.64 percent a year in real terms.6 During this period the growth in net state spending (not including federal reimbursements) was 2.26 percent. This means that the amount of state money being spent altogether on education, healthcare, human services, local aid, and the other areas of the state budget was growing more slowly than the economy as a whole. Thus each year the state was spending a smaller share of its resources on the things we pay for through government. At the same time, revenues were growing even more slowly than state spending, at 1.48 percent, leading to the structural imbalance the state budget faces today. What would the state's fiscal condition look like if tax and other state revenue had remained a constant share of the economy? In FY 1998, the state enjoyed a structural budget surplus of approximately $1.05 billion.7 Because of this surplus the state was able to invest in a number of long term needs, including $300 million for capital infrastructure and an additional $300 million in the state's rainy day fund to better prepare the state for future needs. If state revenue had remained 7.4 percent of the economy from FY 1998 to FY 2008, the state would have continued to enjoy a budget surplus, represented in Figure 4 by the shaded portion of the 2008 revenue share. The total value of this surplus over the decade could have exceeded $20 billion. For the reasons described below, however, it is unlikely that surpluses would have been that large under any circumstances. What Could the State Have Done Differently Over the Past Decade? In periods of economic growth state revenue will generally grow more quickly than the cost of maintaining existing services. This creates a strong temptation for states to cut taxes aggressively or increase spending substantially. When a state follows either of those paths, it enters the next recession unprepared. As described earlier in the brief, during the 1990s, Massachusetts responded to short-term surpluses caused by the dot-com boom with significant, permanent tax cuts which cost $2.5 billion a year.8 In addition, declining sales tax revenue cost an additional $1 billion a year. As a result, the state entered the recession early in this decade in a very precarious position. Had the state not cut taxes deeply in the late 1990s, a series of other policy options would have been available. Had the same share of the economy continued to be devoted to state taxes and fees, the deep budget cuts implemented in the recession at the beginning of this decade probably would have been much less severe. During the last recession, the state cut funding for local aid, K-12 and higher education, public health, environmental protection and other areas of government.11 Over the past several years state spending has increased as some of the funding cut in those areas has been restored. Yet in many areas total spending, as a share of the economy, is still below the levels it was at before the last recession (described in more detail in Section 2 of this paper). Instead of making substantial, permanent tax cuts, the state could have been more cautious in its revenue policies, in anticipation of future downturns. Some of the reductions in taxes, such as the $1 billion dollar decline in sales tax receipts, were not the result of active policy choices. Had the state taken no actions to reduce taxes, this billion-dollar reduction still would have occurred as a result of a number of factors, including the growth in the Internet and in the service sector of the economy. The state also could have chosen to protect some of the sales tax by broadening the base to include services and reduced other taxes instead. Even if the state had invested half a billion dollars a year more in addressing long-term challenges, had implemented a billion less in budget cuts in FY 2002, and allowed sales tax receipts to decline as they did, the remaining surpluses still could have been large enough for the state to have built $7.6 billion in reserves. What is the relationship between the short-term and long-term issues? Even if the state were to keep revenue and spending at a constant share of the economy over the long term, there would still be business cycles that would create periods of fiscal difficulty. In comparing FY 1998 and FY 2008 we are comparing two similar points when the state was about six years into an economic recovery. To be able to maintain services and fiscal stability, state revenue should be a similar share of the economy in similar points in the business cycle. In periods of recession, however, revenues will fall even if they are a constant share of the economy. If the economy shrinks and there are no changes in tax policy, tax revenue will decline. At the same time, state spending is likely to increase even without any changes in state policy: if everyone below a certain income level is eligible for a particular safety net protection – like Medicaid – then the number of people using those services will increase as more people lose their jobs and their incomes fall below the eligibility threshold. For these reasons, balancing the state budget becomes more difficult during periods of recession. That is why states need to build reserves in good times. While the state has gone through cycles of cutting taxes in the 1990s, cutting spending and raising some taxes in the FY 2002 to FY 2004 budget crisis, and restoring some services in the past several years, the state faces the current recession with only modest reserves and revenue levels significantly lower, as a share of the economy, than they were in the late 1990s. How Different Would Our Fiscal Condition Look Today if There Had Been Different Fiscal Policy Choices Made Over The Past Decade? In the late 1990's the state responded to the strong economic climate by making significant tax cuts. There would be two major differences in the state's fiscal condition if the state had not enacted these tax cuts. First, the state could have a significantly larger balance in the Stabilization Fund. As described above, even if the state had allowed the erosion of the sales tax and had invested $5 billion more in meeting long-term challenges over that period and $7 billion more in reducing cuts, the balance in the Stabilization Fund still could have grown by $7.6 billion. A Stabilization Fund balance of that amount could significantly cushion the fiscal blow that the state now faces. Second, the gap heading into FY 2010 would be significantly smaller if the revenue base had not been reduced by $3.34 billion. Assuming, again, a middle path in which taxes declined by $1 billion, ongoing spending increased by $1 billion, and the state had made a series of half billion dollar investments in meeting long-term challenges, then the FY 2010 gap would be approximately $1.3 billion smaller than it will be. In addition, the spending to meet long-term challenges could appropriately be suspended during the recession allowing $500 million in savings without eating into core operating funding for state government. Figure 5 shows how different categories of spending have changed over the years. The following section discusses these spending changes, by programmatic area. Education spending includes pre-school, K-12 and public higher education, and comprises the second-largest category of state expenditures. Education spending increased as a percentage of personal income between FY 1998 and FY 2002 as the state made funding the education reform initiatives of the 1990's a priority. Spending declined during the fiscal crisis in the early part of this decade, with state public higher education being particularly hard hit. While education spending has increased since FY 2005, it has not yet returned to the spending levels of FY 2002 as a percent of personal income. Recent spending increases in education are largely the result of an increased focus on early childhood education and the implementation of changes to the state's K-12 school funding formula. Environment spending includes the Department of Environmental Protection, the Department of Conservation and Recreation and other programs within the state's Executive Office of Environmental Affairs; it is the smallest category of state spending in the figure above. Between FY 1998 and FY 2008, environmental spending in the state has remained steady as a percentage of personal income at around 0.1 percent. Economic development includes labor, workforce, housing and economic development programs. Between FY 1998 and FY 2008 spending in this category, measured as a share of personal income, remained relatively constant at around 0.4 percent. However, in real dollars spending has increased slightly over this period. Like other categories of spending, economic development programs experienced decreased funding during FY 2003-2004. Since that time, funding has returned to prior levels. Health Care includes all spending for MassHealth (Medicaid), spending associated with other health care programs including the costs of the 2006 health reform law, public health spending, spending on mental health services, and spending on state employee health insurance. Between FY 1998 and FY 2008, spending on health care grew from 2.4 percent of total personal income to 3.2 percent. This number, however, overstates the net state spending on health care, because close to half of MassHealth spending – which represents more than two-thirds of total health care spending – is paid for by the federal government. 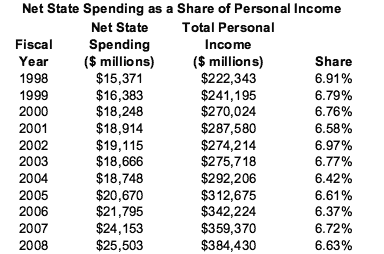 If we were to subtract the federal share of health care spending from these totals, net state spending on health care grew from 1.6 percent of total personal income to 2.1 percent of total personal income. This increase in net state spending on health care, while not as large as the increase in total state spending on health care, is still notable and is due to several factors. Although there were significant cuts to the MassHealth program and other health care programs during the middle part of the decade analyzed, in FY 2006 the Commonwealth began another major health care expansion with the passage of Chapter 58, the state health reform law. MassHealth membership once again has topped 1 million members, and the Commonwealth also provides subsidized health insurance to more than 160,000 persons in the new Commonwealth Care plan. At the same time, health care cost inflation has outstripped general inflation, increasing the real cost to the state of maintaining health care services. Not only has health care cost inflation significantly affected the cost of the state Medicaid program, it has also affected the cost to the state of providing health insurance to state employees. Human services includes funding for the state's child welfare programs, social services, cash assistance, veterans services and services for other vulnerable populations.12 Between FY 1998 and FY 2008, human services spending has decreased substantially as a percentage of personal income, from 1.2 percent to 0.9 percent. This reduction is largely due to a decline in spending on direct cash assistance programs that was not matched by a reinvestment of those funds in other human services programs, such as child care. Human services spending has increased slightly in real dollars over this same period. Law and public safety includes the state's court, prison and law enforcement systems. 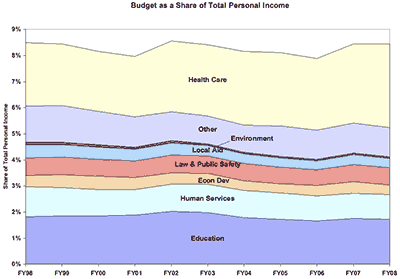 Between FY 1998 and FY 2008, spending in this category has remained relatively constant as a share of personal income at approximately 0.7 percent. However, spending has increased over this time. Local aid includes the state's lottery aid, additional assistance and reimbursements to cities and towns for state owned land. Between FY 1998 and FY 2008, aid to cities and towns has decreased slightly as a percentage of personal income, from 0.5 percent to 0.4 percent. This reduction reflects decreases in additional assistance over that time. Since FY 2003-2004, local aid has increased, though not to its prior levels, as the state has uncapped lottery aid to cities and towns. Other includes the state's elected offices, pension system, salary reserves and other miscellaneous spending. 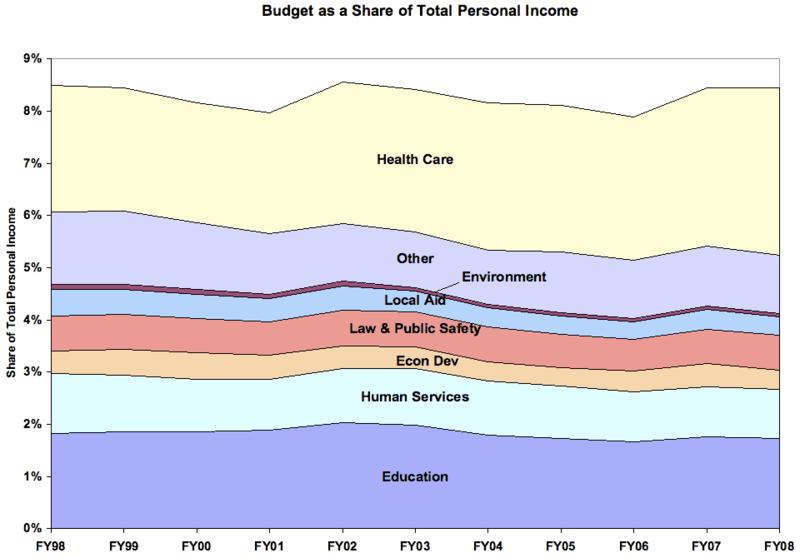 Spending in these other categories decreased substantially as a percentage of personal income between FY 1998 and FY 2008. This decrease is the result of level funding across many of these categories as total personal income increased. 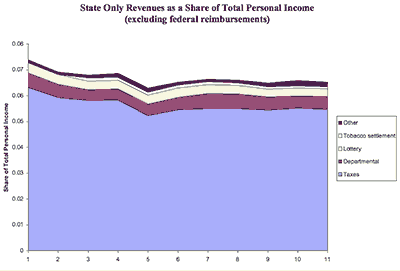 Figure 6 shows the composition of state tax revenue between FY 1998 and FY 2008. During this time, revenues as a a share of personal income fell $3.34 billion. The largest part of this is the $3.26 billion decline in tax revenues over that time. In order to understand how the state's revenue picture has changed from 1998 to 2008, it is important to look at how the major sources of tax revenue have changed over that time. Income Tax – the income tax is the single-largest source of state revenue. Over the period being examined, income tax revenues as a percentage of personal income have declined due to a series of tax cuts. As discussed above, the personal income tax rate of 5.95 percent, in effect for calendar years 1998 and 1999, was reduced over three years to its current rate of 5.3 percent by 2002. These tax cuts, along with cuts to the tax rate on interest and dividend income and increases in the personal exemption, cost $2.56 billion. This amount was partially offset by the repeal of an earlier capital gains tax cut, and other measures. All told, income tax collections, as a percentage of personal income, dropped by $1.4 billion, or 10 percent between FY 1998 and FY 2008. Sales tax – the sales tax is the second-largest source of state tax revenue. 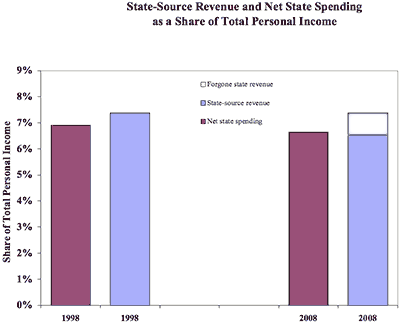 While the sales tax rate remained constant at 5 percent over the period between FY 1998 and FY 2008, the percent of personal income devoted to the sales tax has declined over that time due to Internet sales and the increasing share of spending devoted to services.13 Calculated as a share of personal income, sales tax revenues declined more than 20 percent between FY 1998 and FY 2008. The drop in the sales tax resulted in more than $1 billion in lost revenue in FY 2008. 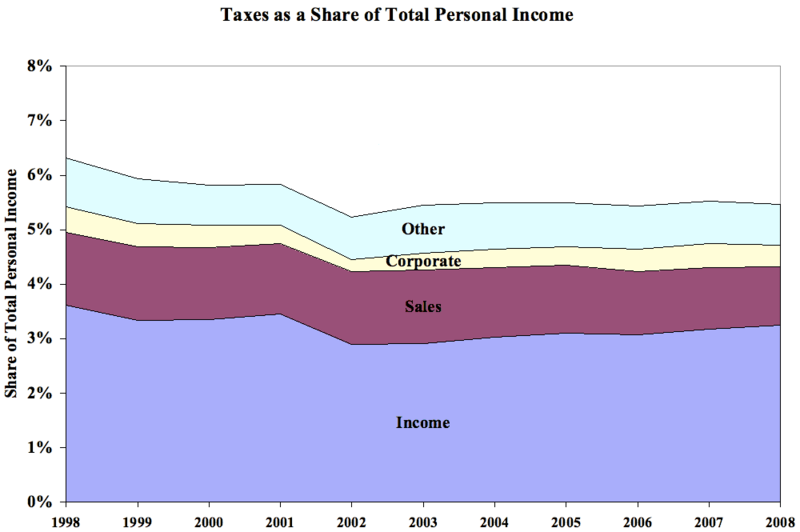 Corporate taxes – corporate taxes declined between FY 1998 and FY 2008 by $332 million, or more than 18 percent as a share of personal income. Recent closure of corporate tax loopholes should slow this erosion in the future, but like other elements of state revenue, corporate taxes experienced a large decline over the previous 10 years. Other taxes – other taxes include cigarette, gasoline and alcohol taxes, as well taxes such as those on banks and insurance companies. While cigarette tax revenue increased substantially over this period, revenues associated with other taxes remained relatively flat in nominal dollars, meaning that when seen as a share of personal income, other tax revenues have declined by approximately $500 million between FY 1998 and FY 2008. Departmental revenues – departmental revenues include assessments, fees and other charges payable to state agencies, such as the Department of Fish and Game or the Registry of Motor Vehicles. Fees, as a share of personal income, declined $230 million between FY 1998 and FY 2008. Fees declined most sharply up until the financial downturn in FY 2003. In FY 2003 and FY 2004, many fees and other charges were raised, substantially increasing revenues from this source. Since FY 2004, however, departmental revenues have again trended downwards and in FY 2006 these revenues once again fell below their FY 1998 level. Lottery revenues – lottery revenues, after prizes are distributed, have declined in recent years. Between FY 1998 and FY 2008, lottery revenue, as a share of personal income, decreased in every year except FY 2002. Lottery revenues in FY 2008 had declined by $370 million, or almost 25 percent, from their share of personal income in FY 1998. Tobacco settlement – beginning in FY 2000, the state began receiving revenue through a settlement with tobacco companies. This revenue source has been relatively consistent in recent years, although this consistency has meant it has declined as a percentage of personal income. 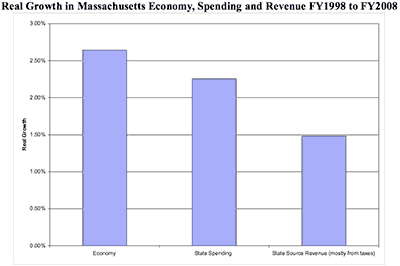 Massachusetts enjoyed substantial budget surpluses in the mid- to late- 1990s. But even before the economic decline of the past year, the state budget already had a structural deficit in FY2008. While the immediate cause of Massachusetts' fiscal crisis is the national recession, policy choices made over the past decade created a structural deficit that have reduced the state's ability to address the economic downturn. Understanding the origins of the structural deficit requires examining three factors: economic growth, changes in state spending, and changes in state revenue. Over the long term, if spending and revenue grow at the same rate as the overall economy, a state can maintain fiscal stability. Between FY1998 and FY2008, Massachusetts' economy grew at an annual rate of 2.64 percent in real terms. During this period, net state spending grew at an annual rate of only 2.26 percent. This means that the amount of money being spent on education, health care, human services, local aid, and the rest of the state budget was growing more slowly than the economy as a whole. If spending was declining as a share of the economy, why did the state's fiscal condition deteriorate? During the same 10 years revenue, which includes state taxes and fees, grew at an annual rate of 1.48 percent which was significantly slower than the growth of the economy as a whole. This was because the state made substantial income tax cuts and the sales tax has not kept pace with changes in the economy. If the tax revenue had grown as a steady share of the economy during these past 10 years, Massachusetts would have shown a substantial surplus and would have been in a far better position to weather the current national recession. While the immediate cause of the fiscal crisis is the national recession, policy choices over the past decade have weakened the Commonwealth's capacity to weather this storm. In FY2008, while the economy was still strong, the state budget was already structurally unbalanced. This fact sheet summarizes the tax changes in the decade between 1998 and 2008 that erased large budget surpluses and left the state fiscally unstable. 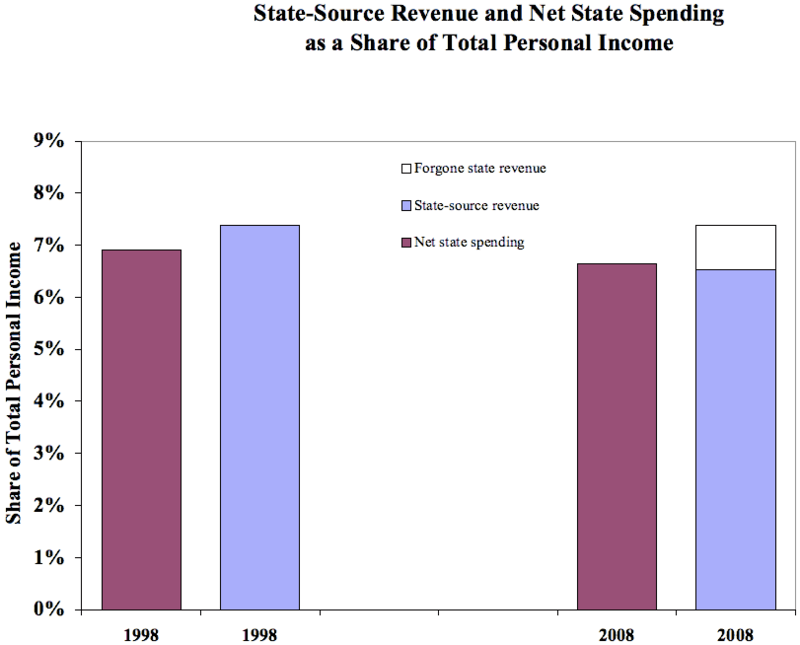 Overall, state taxes as a share of the economy were $3.3 billion lower in FY2008 than they were in FY1998. The two primary causes of this decline were income tax cuts and erosion of the state sale tax. The income tax rate was reduced from 5.95 percent to 5.3 percent, costing $1.3 billion. The tax rate on dividend and interest income was reduced from 12 percent to 5.3 percent, costing $720 million. The personal exemption was increased from $2,200 per person to $4,400 per person, giving each taxpayer a cut of $117, and costing $440 million. In 2002 the state repealed the capital gains tax cuts enacted in 1994 which increased revenue by $1.1 billion. Overall changes in the state income tax resulted in net loss of $1.4 billion in income tax revenues. While the sales tax rate remained constant at 5 percent over the period between FY 1998 and FY2008, sales tax revenue was $1 billion lower in FY2008 than it would have been if it had grown with the economy. Use of the Internet to purchase goods has increased significantly over the past decade. Under current federal law it is very difficult for merchants to charge state sales taxes for items purchased over the Internet. The service sector, which is not subject to the sales tax, is growing as a share of the state's economy. State spending, as referred to in this brief, includes all budgeted amounts for each fiscal year being examined (the General Appropriation Act plus any funding added or subtracted over the course of the fiscal year in supplemental budgets). Our totals include what we refer to as "pre-budget transfers." These amounts (for the MBTA, for school building assistance and for pensions) are totals taken directly from state revenues that are by statute allocated for specific purposes. For example, one penny of all sales tax receipts are dedicated to funding the MBTA, and one penny is dedicated to school building debt assistance; the amount required to fund the state's pension liability is written into statute. Our spending totals also include funding each year that legislation transfers from the state's budgeted funds into non-budgeted special revenue trusts. Once money is transferred into these trusts, it can be expended without further appropriation. An example of one of these special revenue trusts is the state's Science, Technology, Engineering and Mathematics (STEM) Grant Fund. In FY 2008, the state transferred $4 million to the STEM grant fund. It is therefore shown as $4 million in spending in FY 2008. Our spending estimates may slightly overestimate spending because they include state spending on certain pharmaceuticals and other items for which the state later receive rebates from manufacturers. Because these rebates reduce the net cost of the items, one could subtract the amount of the rebate from both spending and revenue received in the rebate to reflect the true cost of the service to the state. Tax revenue as listed in the Commonwealth of Massachusetts' 2008 and 2007 Statutory Basis Financial Report (SBFR) Ten Year Schedule of Tax Revenues by Source. This amount includes the portions of the sales tax dedicated to the MBTA and School Building Assistance program. Assessments and departmental revenues received by the Commonwealth into budgeted funds, with the exception of revenues into the Stabilization Fund or the administrative control funds. This amount was calculated from the Budgeted Funds statement in the state's annual SBFR. Miscellaneous revenue received by the Commonwealth into budgeted funds, with the exception of revenues into the Stabilization Fund or the administrative control funds. This amount was taken from the Budgeted Funds statement in the state's annual SBFR. State lottery revenues, excluding amounts paid out in prize money. This amount was taken from the Budgeted Funds statement in the state's annual SBFR. Fringe benefit cost recovery revenues. This amount was taken from the Budgeted Funds statement in the state's annual SBFR. Revenue received through the state's settlement with tobacco companies. The total amount of revenue received by the state is recorded in the Health Care Security Trust Fund statement in the state's annual SBFR. 1. See Elizabeth McNichol and Iris J. Lav, "State Budget Troubles Worsen," Center on Budget and Policy Priorities, Updated December 10, 2008, http://www.cbpp.org/9-8-08sfp.pdf (accessed December 11, 2008). 2. This brief looks at trends over a decade because both FY 1998 and FY 2008 represent a similar part of an economic cycle, making for an appropriate comparison. 3. In order to gauge economic growth, this brief uses growth in total personal income. Personal income as used in this brief is derived from the Bureau of Labor Statistics official definition, but includes two adjustments as recommended by the New England Public Policy Center of the Federal Reserve Bank of Boston. These adjustments are to include capital gains in the calculation, because it provides a more complete picture of economic growth, and also to provide a residential adjustment for earnings of residents of other states that work in Massachusetts. For a discussion of adjusting personal income to better reflect growth in the economy, see New England Public Policy Center of the Federal Reserve Bank of Boston, "Assessing Alternative Measures of State Income," July 30, 2008, available at http://www.bos.frb.org/economic/neppc/memos/2008/weinerpopov073008.pdf. For the analysis in this brief, we follow the methodology recommended by the Federal Reserve Bank. In this brief, "personal income" and the "economy" are used interchangeably when discussing the size of the economy. 4. We use the term "net state spending" to describe state spending paid for by all sources of revenue other than revenue from the federal government. It is important to differentiate net state spending which excluded federal sources from total spending which includes spending from federal revenues because we want to identify the extent to which spending trends have caused pressure on the state's treasury. Net state spending does not include funds deposited into the state Stabilization Fund, the Capital Improvement and Investment Trust Fund or the Debt Defeasance Trust Fund. 5. This foregone revenue is calculated by applying the FY 1998 share of personal income devoted to state revenue (7.4%), applying that percentage to FY2008 total personal income ($384.4 billion) and subtracting FY 2008 actual state revenue from that number. 6. Real growth is measured as Compound Annual Growth Rate (CAGR). This brief calculated real growth by first adjusting fiscal year 1998 numbers for inflation and then using the CAGR formula to calculate annual growth. 7. This surplus is the difference between ongoing state revenues, shown in table 2, and ongoing state spending, shown in table 1. We considered the following FY1998 expenditures to be one time surplus spending: $317.4 million for the Commonwealth Stabilization Fund, $200 million for tax reductions, $300.7 million for capital improvements, $162.5 for the Tax Exemption Escrow Trust and $60 million for a teacher, principal and superintendent quality fund. 8. More information is available in "Trading Places: The Role of Taxes and Spending in the Fiscal Crisis," available at http://www.massbudget.org/file_storage/documents/trading_press.pdf and "Tax Cuts and Continued Consequences: States That Cut Taxes the Most During the 1990s Still Lag Behind," available at http://www.cbpp.org/12-19-06sfp.htm. 12. The Human Services category the Department of Mental Health, which is included within the Health Care category. 13. Under current federal law it is difficult for the state to require merchants who sell over the Internet to collect sales and use taxes on their sales in Massachusetts. Thus, as more goods are purchased over the Internet, the state is able to collect sales taxes on a smaller share of the goods purchased by Massachusetts consumers. Similarly, the shift in spending towards services, such as education, health care, or home improvements and away from goods reduces the share of consumer spending that results in the payment of sales taxes.